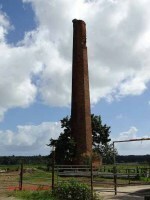 This chimney is approximately 1 1/2 miles NE from where Central Pasto Viejo was located, and maybe a similar distance to where we understand Central Triunfo was located. It lies within the municipal boundary of Humacao, not too far south of the line between Humacao and Naguabo. A resident of the area told us this hacienda was once called Victoria. 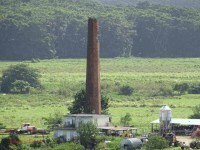 We understand it has also been refered to as Hacienda Mulas, however, Mulas is reported to have been in Naguabo while as stated before, this smoke stack is in Humacao. It is possible that throughout the years, the hacienda had more than one name as it was common for new owners to change prior names and that changes in municipal boundaries had it at different times located in different municipalities. 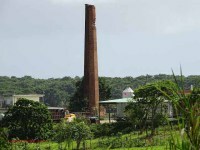 The current owner of the lands where the chimney sits is Roberto Mendoza who operates a dairy farm. Our research indicates he acquired the property from the Land Authority of Puerto Rico who in turn acquired it from Eastern Sugar Associates. That being the case, it is safe to assume this trapiche and its surrounding land was at one time acquired by and formed part of Central Pasto Viejo which was one of the 5 sugar mills owned by Eastern Sugar Associates. The hole near the top of the chimney was caused by lighting.